We’ll start with fiberglass since it’s the most commonly recognized type of insulation. While this insulation may be popular, that doesn’t mean it’s always the best to use in every instance. One of the main reasons it’s popular is simply because of how accessible it is. That being said, it has just as many advantages as disadvantages. Cheap and effective, can be bought at almost any hardware store. Comes in rolls or batts, making installation quick and easy. It often comes with a plastic covering which helps create a vapor barrier against humid air. No special tools or equipment are required to lay it in place. This type of insulation does not prevent the transfer of air, so it’s essential that cracks and gaps are sealed before installation. Fiberglass slivers can irritate the skin or be inhaled, so it’s essential to have safety equipment. Due to gravity, ceilings and walls may not be able to benefit from the insulation properly as it may sag. Tight corners and small spaces may not accommodate the shape of the insulation. This type of insulation is less commonly used only because it requires special tools and skills to install it. By spraying wet cellulose insulation from a hose, it’s capable to do a much more thorough job with the insulation. Made of recycled paper, making it eco-friendly and safer for use inside the home. Covered with fire retardant so that it’s less likely to be impacted by the heat of the attic and wiring. Can fill tight corners, gaps, and stick to ceilings and walls, making it very effective in all the applications where fiberglass insulation rolls and batts can fail. The cellulose settles over time, allowing it to conceal gaps and cracks. 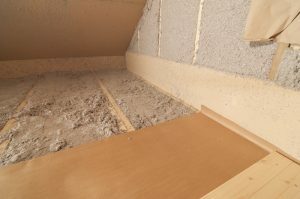 If the brand of cellulose is not treated with acrylic binders, it can settle too much and lose some of its R-value (this is a measurement of the insulation’s heat resistance). If not installed properly, moisture can become a problem and may cut down the R-value. Will require the separate installation of a vapor barrier. There’s endless debate about which type of insulation is more effective. In terms of what’s most practical, it truly depends on what your home and attic looks like. That could be the tipping point for deciding which type of insulation is best. For any heating services in Brandon, MS, including insulation, we highly suggest letting a professional make these decisions for you. Contact AirSouth Heating and Cooling to request an estimate for installing insulation.